Apostolic Administrator of the Diocese of Buchach (Buatschatsch), Feast of St. enlarged. Basil the Great in Buchach OB Basilian monastery. 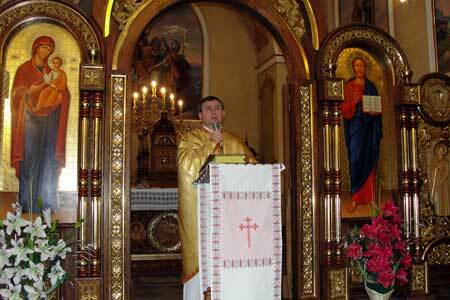 The solemn liturgy began, after the Divine Liturgy, under the leadership of the Apostolic Administrator. Dmitro Hryhorak OSBM, concelebrated by Fr Makary Soliuk OSBM, abbot of the monastery in the town of Buchach, and Father Symeon shortcoming OSBM Secretary of the Apostolic Administrator. Among those attending the reverend sisters, the head of the district Buchach Mr. Pastukh with representatives of government, the education sector were present. In his address to the clergy and the faithful of the Apostolic Administrator told the family that grew up in St., raising education and the ministry of the church and its neighbors. After St. Basil lived in a pious family, four children are ready to serve family, God. Education, which was sacred to the highest degree attained at this time. But his ministry was written with golden letters in the history of the church. It was Basil the Great wrote many valuable works, which are addressed as spiritual, and the laity, gathered and organized in an ascetic monastery founded Baszlianer, they became targets for the poor village children, orphans, the poor. He was the bishop, "Father of the poor and needy. He was the perfect Christian is what encouraged us. Strengthened by the Word of God during the liturgy, sermons, took many of the faithful from the hands of an administrator of the diocese, the Holy Eucharist. After the Holy Mass is one, thanks, wishes and many summers and pleads for Basilian for birthdays and faithful. Thereafter, the Apostolic Administrator of the Audience sprinkled holy water. To present the increase of the Spirit and Word of God and blessing the faithful returned to their homeland.